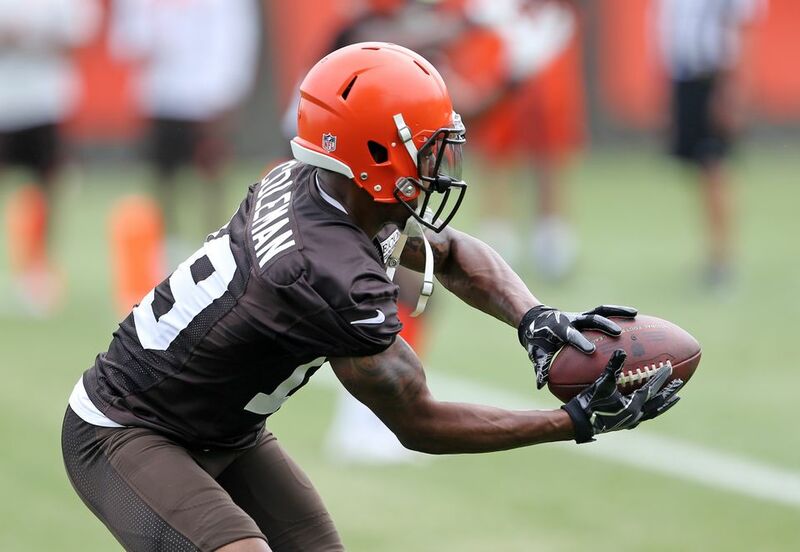 He held on to this practice pass, but Corey Coleman ultimately didn't earn his stripes. One approach the John Dorsey-led Browns have decidedly not emphasized in 2018 is watching holdover talent learn and grow within the system they hope takes root. No, rather, they’ve clearly scrutinized every man on last year’s team and applied a strict value methodology. Starting DT Danny Shelton traded to the Patriots as part of an exchange of mid-round draft picks. The former 12th-overall pick has a year left on his rookie contract, guaranteeing a $2 million salary. The entire 2017 quarterback room cleared out via trade that reaped DB Damarious Randall and a few low draft picks. The Browns clearly saw little worth building upon with DeShone Kizer, Kevin Hogan, and Cody Kessler, though all had very affordable contracts, especially at that position. They also have zero combined wins as NFL starters. Second-year OT Roderick Johnson was waived in June (and soon claimed by the Texans). The Browns quickly decided the 2017 fifth-rounder wasn’t a viable competitor to replace retired LT Joe Thomas. They took a flyer on former second-overall pick Greg Robinson instead. Starting CB Jamar Taylor was sent packing to Arizona for a sixth-rounder in 2020 just one year into his three-year, $16.5 million Browns contract. Arguably last year’s best Browns cornerback, Jason McCourty was traded to New England for an exchange of low picks even before Denzel Ward was chosen fourth overall. The 30-year-old is scheduled to earn nearly $3 million as a Patriot. And now comes the news that despite uncertainty with Josh Gordon and Ricardo Louis going on injured reserve, WR Corey Coleman is also an ex-Brown. The oft-injured first-rounder in 2016 was hobbled with a sore hamstring during his last practice in Berea. Assuming he passes the physical, he’s now a Buffalo Bill with two guaranteed years of seven-figure salaries remaining on his rookie contract. So the 2018 Browns are shaping up not so much as a hodge-podge of legacy athletes plus an influx of new competition for them. Rather, it’s an individualized assessment of each man, his worth, his potential, his cost, and the yield the front office might expect from his on-field contribution versus his trade value. McCourty might be more useful than the fifth cornerback the Browns end up keeping. DeShone Kizer has more upside than Drew Stanton. They were deemed not right for this team at this time. And perhaps Coleman will mature as a receiver, earn his salary, and establish himself as at least a solid NFL contributor. But John Dorsey and crew don’t think so. And given that they got almost nothing in return except cap relief they really don’t need, they seem quite sure in their judgment. This entry was posted in the team today and tagged front office, transactions on August 6, 2018 by Dave Algase.